275 Euro. It does not get much cheaper than this. 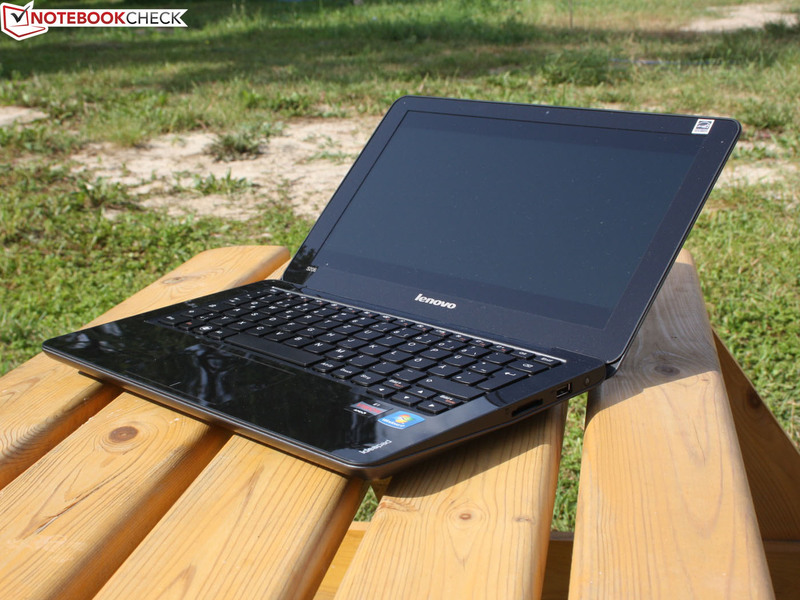 With Lenovo fighting for market share, the Chinese manufacturer introduces its latest netbook – the Lenovo IdeaPad S206. Will a potential customer receive more value than this mobile netbook’s rather low price? 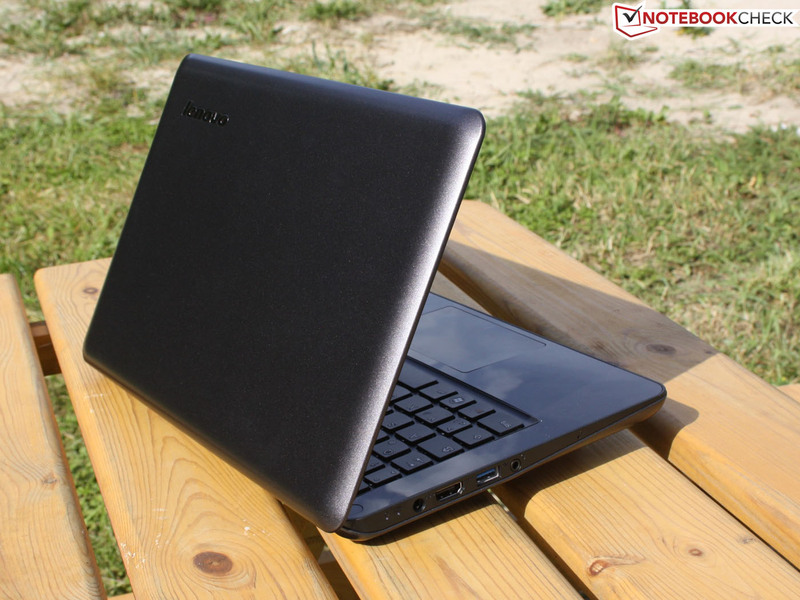 While this netbook may not suit everyone’s tastes, this is a question we will consider in this review. 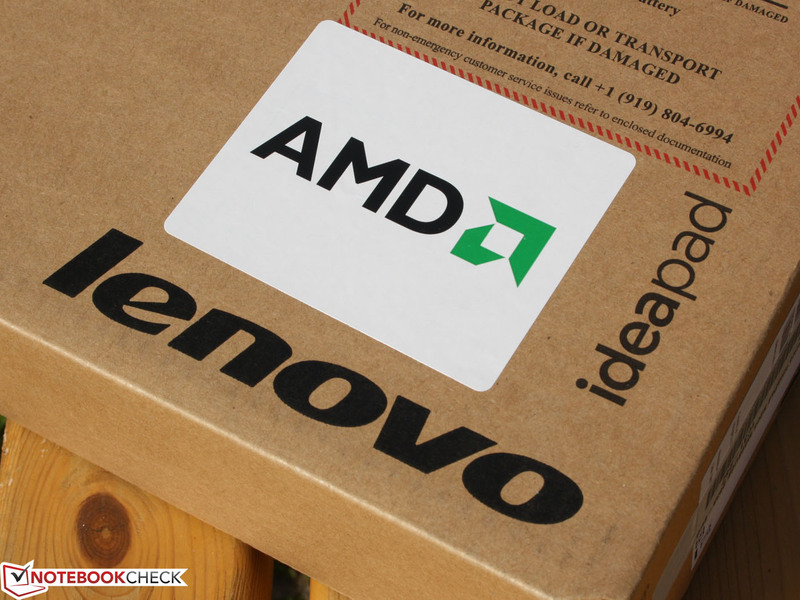 Does the Lenovo IdeaPad S206's AMD E1-1200 APU provide great battery runtime and performance on-the-go? 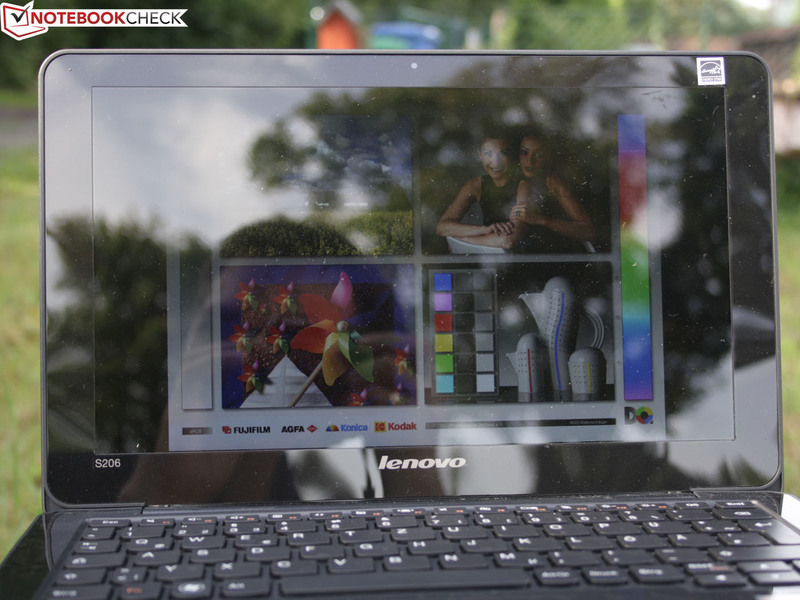 Lenovo desires to expand its market share at all costs and cheap netbooks in large quantities are perhaps one of the best ways to achieve this goal. 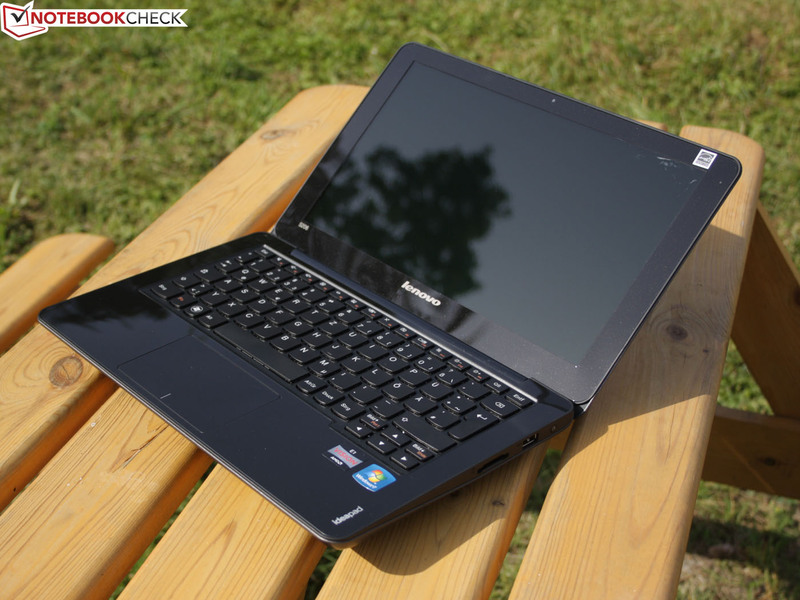 As a result, Lenovo has introduced its small Lenovo IdeaPad S206 for a mere 275 Euro (~$349). 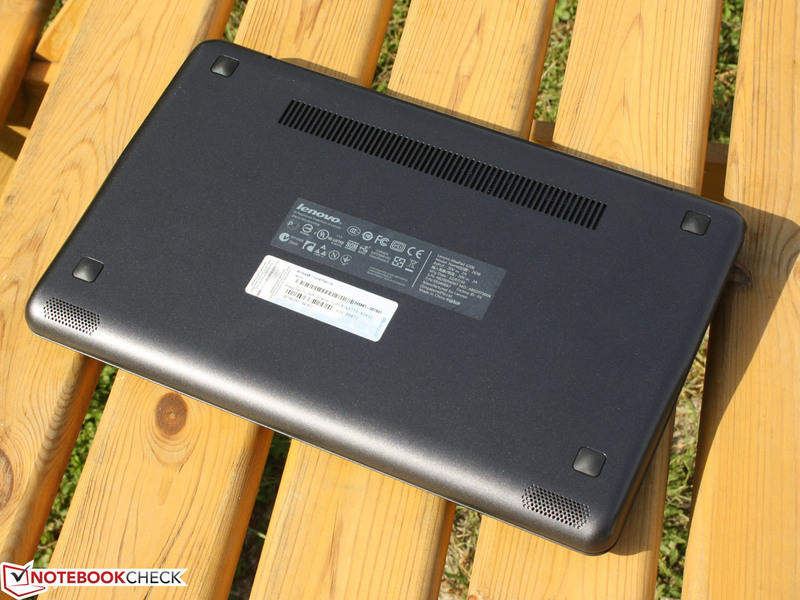 Can the Chinese manufacturer profit from this netbook? We cannot answer this and rather defer this question to financial journals. 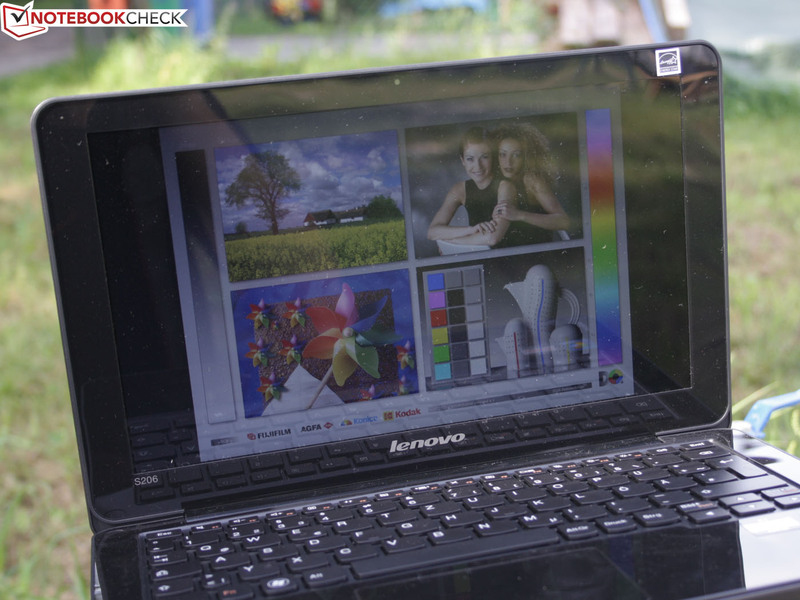 Instead, we consider the technical specifications of the IdeaPad S206. For the aforementioned price, the consumer receives basic equipment. The 11.6-inch netbook is equipped with the AMD E1-1200 APU, a 320 GB hard drive, an HD (1366x768) glare-type display, and 2 GB RAM. The price, however, does not include a Windows 7 license. As we wished to avoid the hassle of installing Windows ourselves, we ordered model M8952GE/M898UGE which includes Windows 7 Home Premium, a 500 GB HDD, and 4 GB RAM. While this configuration carries a significantly higher price of 379 Euro (~$479), the netbook still lacks premium equipment. An alternative configuration featuring the AMD E2-1800 APU can be purchased for 417 Euro (~$529). Unfortunately, our conclusion is that one truly gets what he or she pays for. 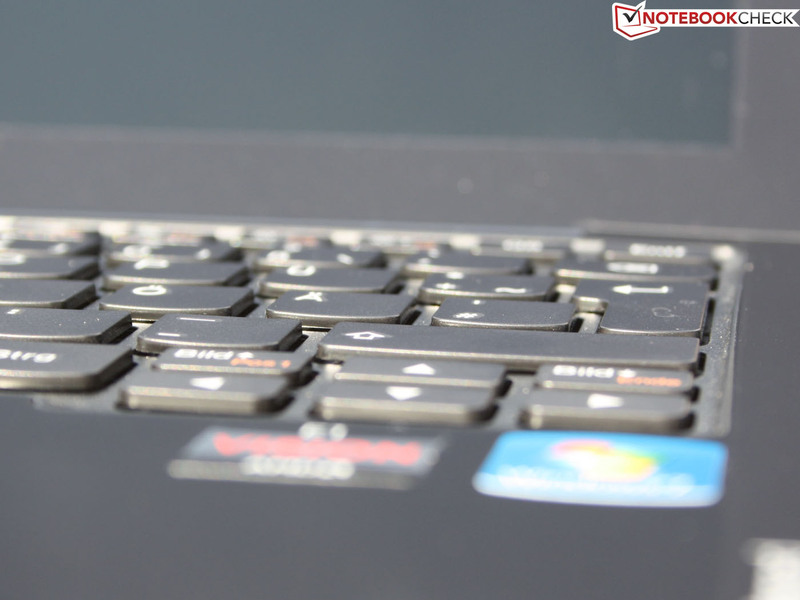 In this review, we will demonstrate the positive and negative qualities of the IdeaPad S206 netbook and explain the above comment. High-gloss finish meets deformable plastic materials. The rubber spacer surrounding the display frame is a nice touch. 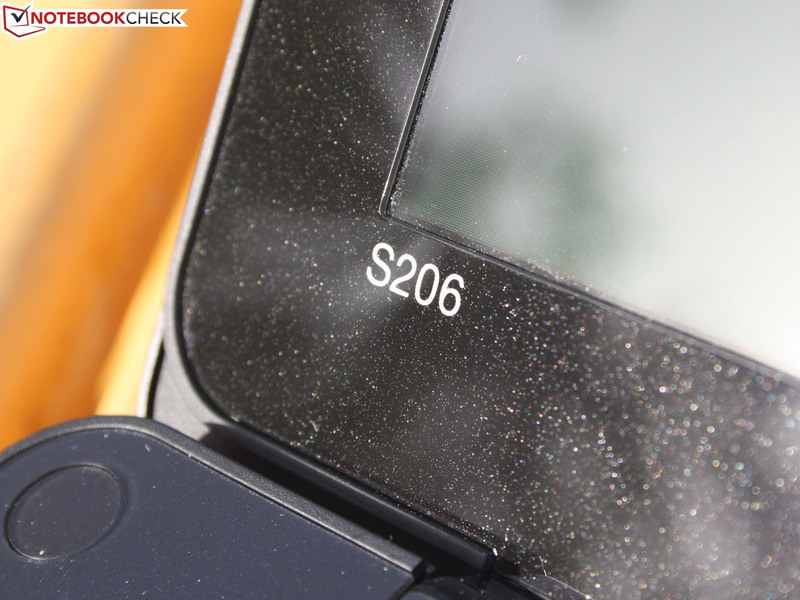 From the outside, the dark gray case of the IdeaPad S206 appears to be very simple. Instead of a tapered base unit, the netbook, or “Sleek Mini Laptop” as marketed by Lenovo, has a uniform thickness of 20 millimeters (0.79 inches). The finished underside proved to be prone to scratches as the rubber feet are rather short and lifting or moving the device led to scratches from the table surface. The system fan is located under a long hinge and the corresponding heat vent is located on the underside. As the netbook lacks both an RJ45 network port and a VGA output, the IdeaPad S206 gave a neat impression. However, the working environment is not exactly boring. The manufacturer has done everything possible to provide some aesthetic touches. For example, the keyboard is framed with a high gloss plastic and a specular finish which appeared almost glittery. The same style was used for the display frame as well. 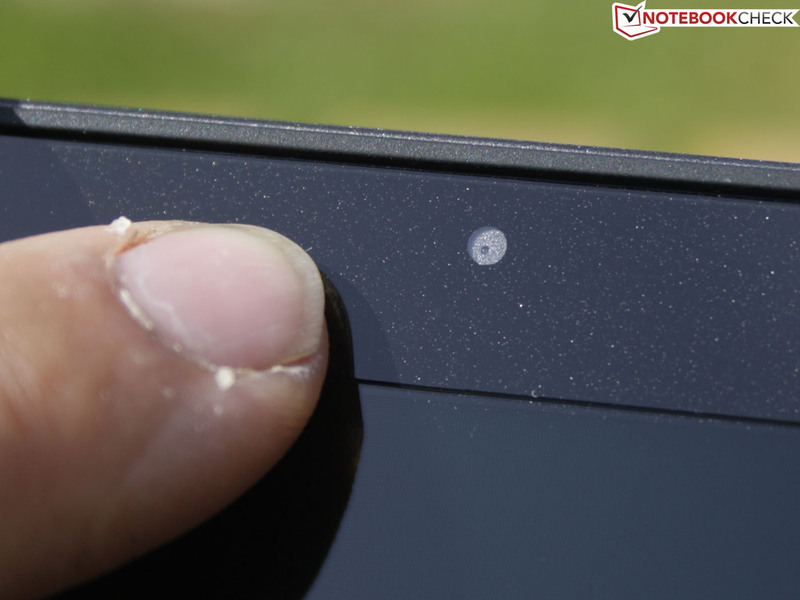 We found these surfaces as well as the touchpad tended to clearly show both dust and smudges. Scratches were less of a problem as the surface is not finished but rather made out of plastic. The stability of the case is not bad. We found the lid to be quite resistant to bending and the surface left a positive impression as it was not easily depressed. A useful detail is the surrounding rubber spacer around the display frame which prevents the glossy display from rubbing against the glossy keyboard. The base unit could be noticeably twisted when using both hands and the unit’s rear could be dented a bit. However lifting the netbook by its front corner did not cause the base unit to flex. Upon inspecting the neat and streamlined case of the IdeaPad S206, it became obvious that Lenovo believes that no one needs VGA and Ethernet. This is perhaps a reasonable assumption as the MacBook Air, which has even fewer ports, sells very well. Some customers may not miss these ports as those choosing to connect the device to an external TV are more likely to use HDMI. However, anyone restricted to using an older monitor or projector will be unable to do so without a VGA port. 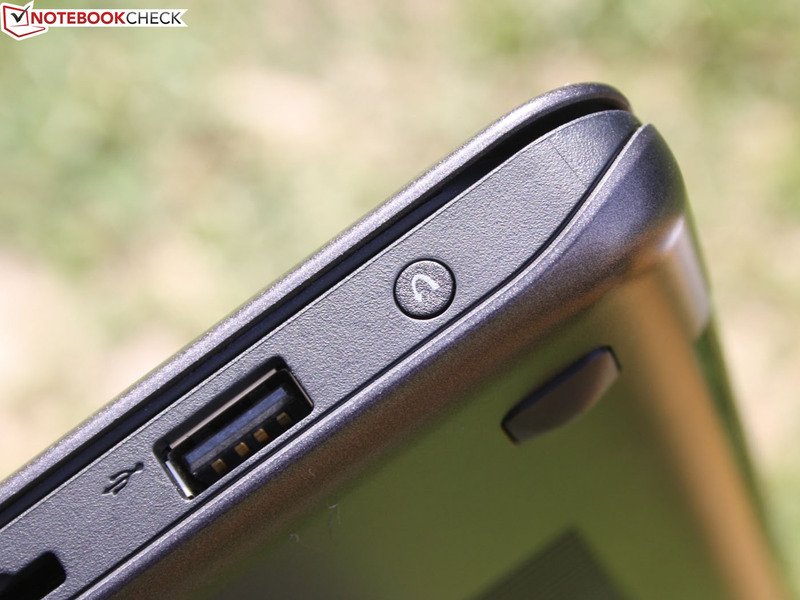 Fortunately, the IdeaPad S206 features a modern USB 3.0 port. This port allows the netbook to be connected to the Fujitsu USB 3.0 Port Replicator PR08 docking station which provides DisplayPort, DVI, Ethernet, and more USB 3.0 ports. That said, it is questionable whether the obviously price-conscious consumer would be willing to spend an additional 150 Euro (~$190) on a docking station for a netbook that does not cost considerably more. As all of the ports are located on the rear half of the left and right sides, cables can be routed to the rear to allow for a streamlined desk or work surface. The IdeaPad S206 is ill-equipped to transfer large amounts of data quickly due to its lack of Gigabit Ethernet. Even the Atheros AR9285 Wi-Fi module paired with a Draft-N router will not have data throughput rates as high as cabled networking. While the built-in Bluetooth module allows communications with portable devices such as smartphones, it only supports the 3.0 standard. The webcam has a resolution of 320x240 which is sufficient only for pixelated video chat. While the pictures taken with the camera had high contrast and good focus, their small size made them of little use. While the base model, which costs 275 Euro (~$349), only includes Free DOS, our test device came with Microsoft Windows 7 Home Premium 64-bit. We did not receive any backup media and were required to produce our own using the included OneKey Recovery and an external DVD writer. The OneKey Recovery key on the right side of the device can be used to activate this process. System recovery from a hidden partition can also be activated using the same key when the netbook is turned off. 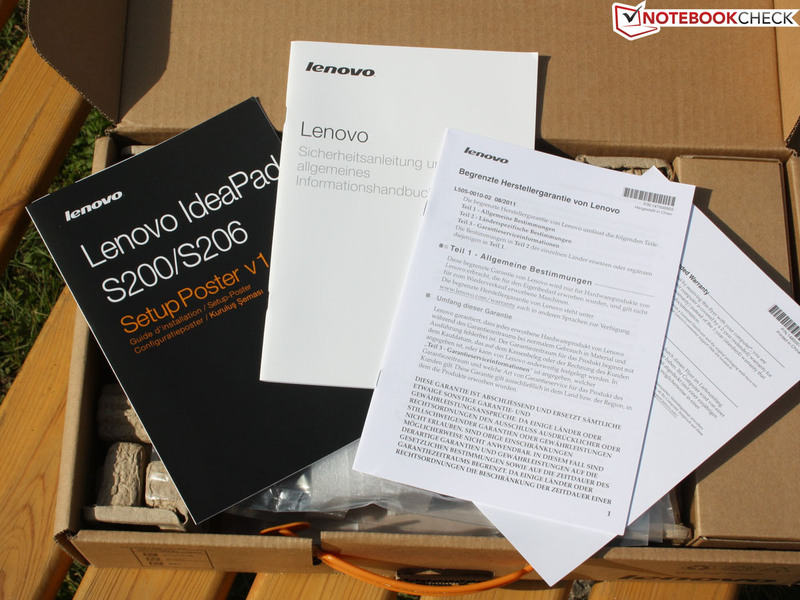 The netbook does not include any drivers which must be downloaded from the Lenovo website for Windows and Linux installations. 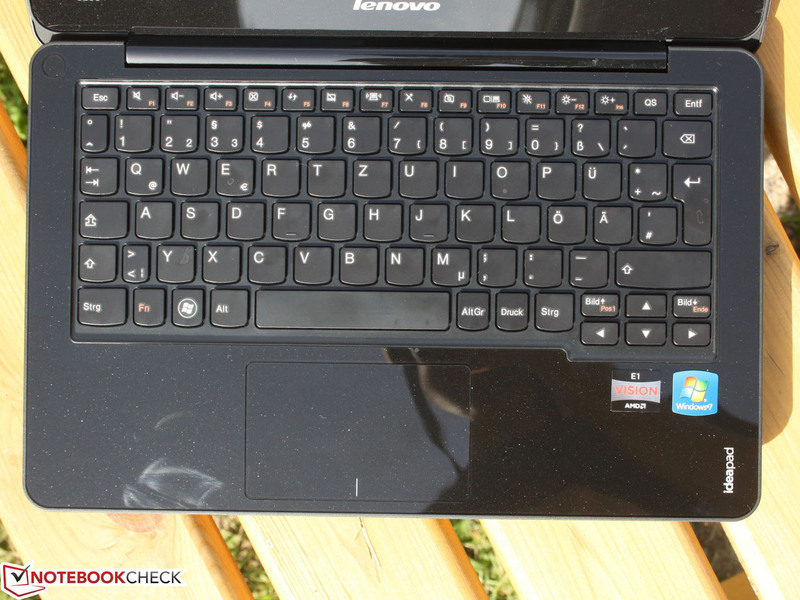 Those wishing to upgrade, clean, or even have a peek under the hood of the Lenovo IdeaPad S206 are out of luck. There is no maintenance cover and the homogenous base cover does not feature a single screw that could be loosened. The netbook lacks a removable battery as well. Considering this, we avoided opening the base unit. 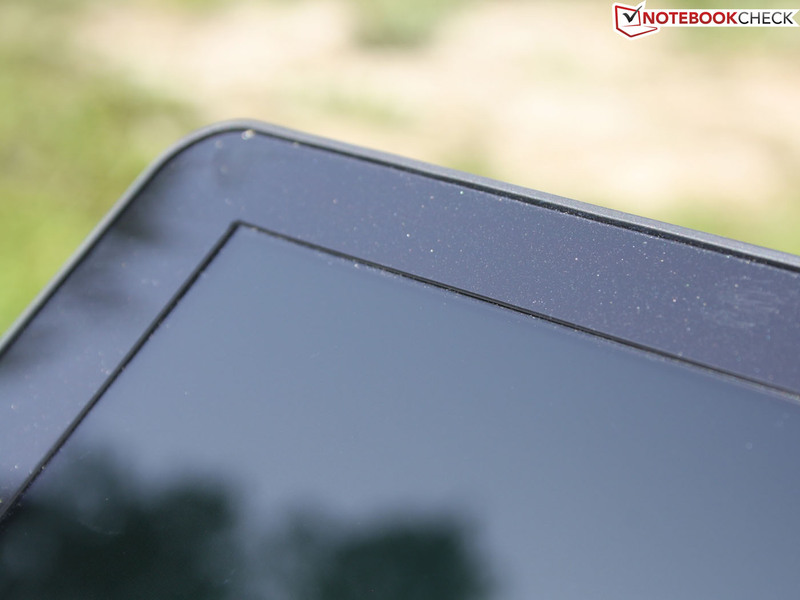 Users of the IdeaPad S206 have of course discovered ways of removing the base cover. The screws are found underneath the rubber feet. 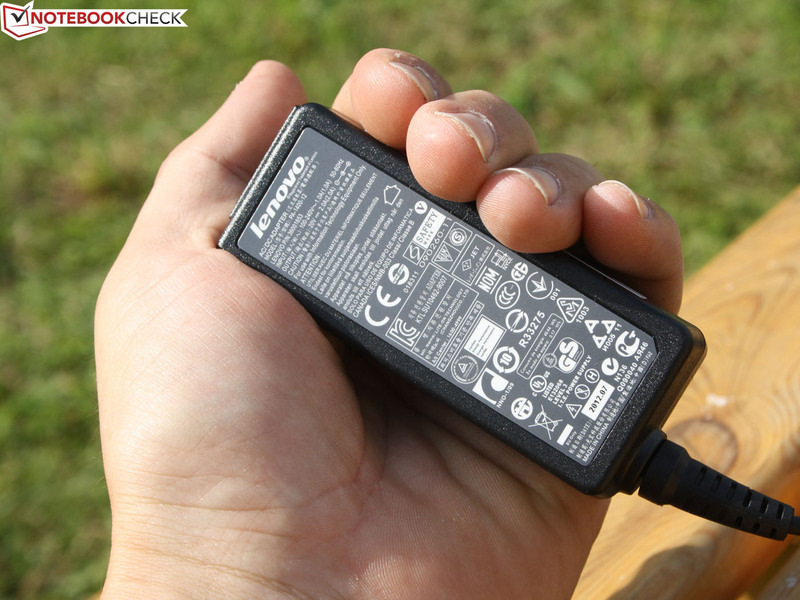 Before replacing any components, the internal battery and USB cable should be disconnected. There is only one RAM slot which was already occupied by the 4 GB maximum in our test device. The IdeaPad S206 includes a 24-month carry-in warranty. Customers can send the netbook to a maintenance site in the event of a defect. Price comparison websites and online retailers mention a 12-month warranty but the device includes a leaflet which mentions a free upgrade to the 24-month warranty. This procedure is the same as that for the Lenovo IdeaPad G585. The battery only has the typical one-year warranty. Manuals are the only included accessory. No storage media. but offers high-contrast colors and focused exposures. 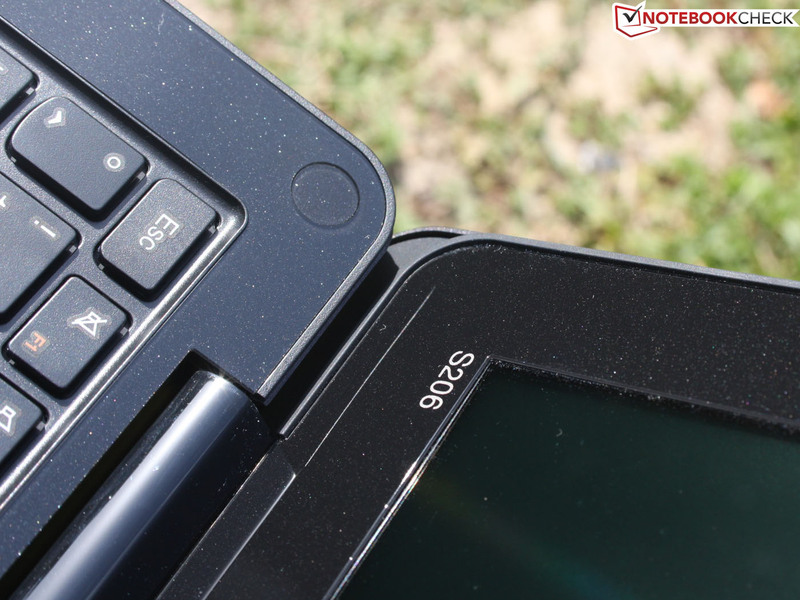 We found typing on the black keyboard of the IdeaPad S206 to be less than fun. While the keys have a medium stroke, the stop is soft and spongy. This also holds true for the middle of the keyboard where the keys gave slightly. The pressure point also felt imprecise and the lack of concave key caps reduced the likelihood of proper key presses. The layout seemed acceptable for the small 11.6-inch measurements. The right and left Shift keys as well as the Enter and arrow keys were reduced in size. The raised ridges for touch-typing could be clearly felt. 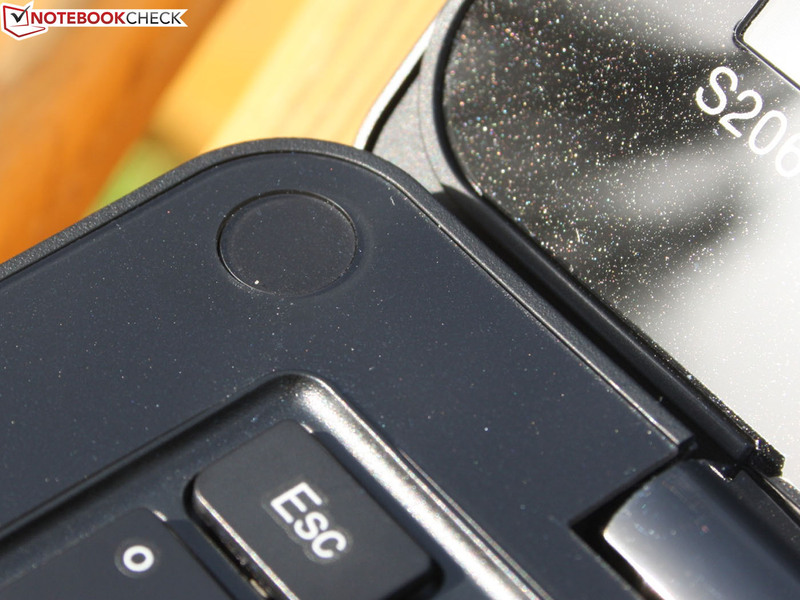 The IdeaPad S206 features the Synaptics ClickPad V8. 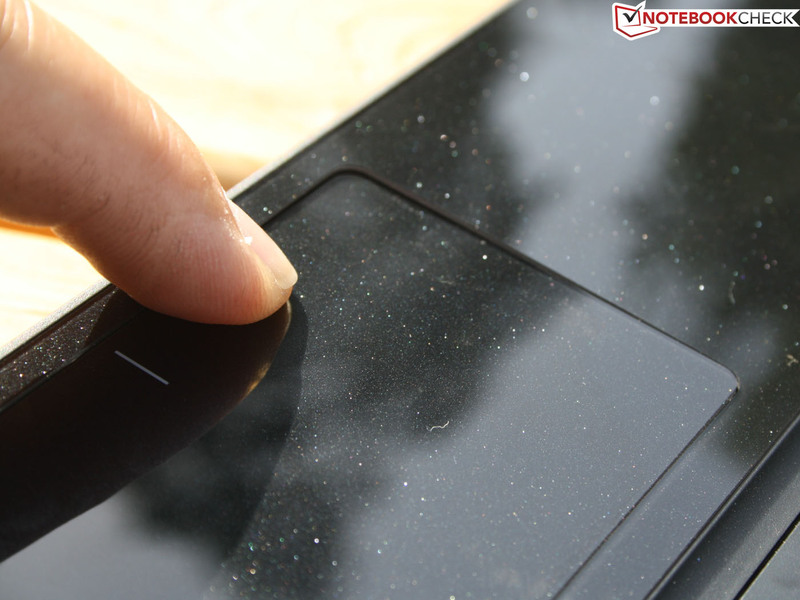 The sleek and relatively large touch surface allows for smooth cursor movement. However, when using slightly wet fingers, the sliding experience became unpleasant as the moisture made the surface feel rough. The ClickPad is positioned on the same level as the wrist rest and is made from the same material. The touchpad supports the typical multi-touch gestures and the integrated mouse buttons are found in the lower portion of the touch surface. It is also possible to press the entire surface in the middle and upper areas to produce a mouse click. The small stroke of this click is perhaps the greatest weakness of the ClickPad. The button stroke decreases as one presses farther from the middle and eventually becomes nonexistent on the edges. This results in a laborious and sometimes difficult feedback. 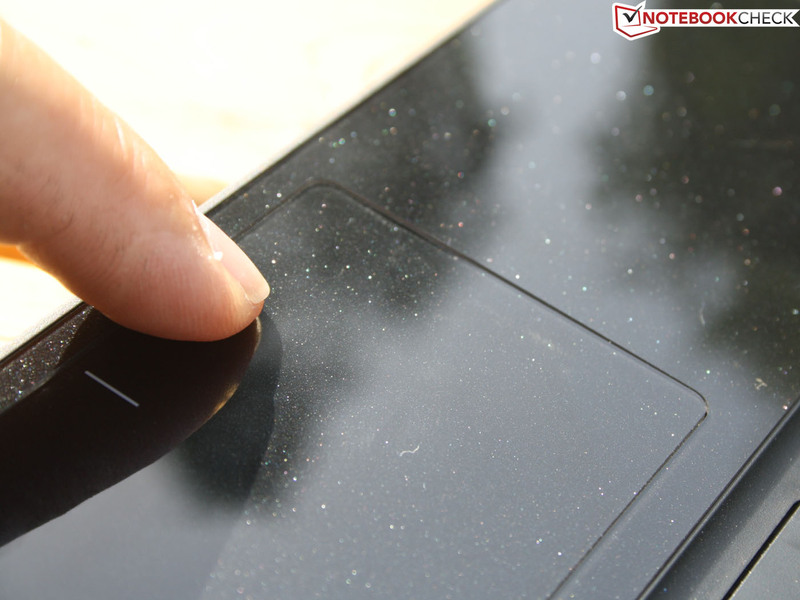 On the other hand, the pressure point is clear and the entire pad makes a loud, dull clicking noise. The keys have a spongy stop and ratting feedback. The keys are even and not concave. The ClickPad does not feature distinct buttons. The glide feel was unpleasant. 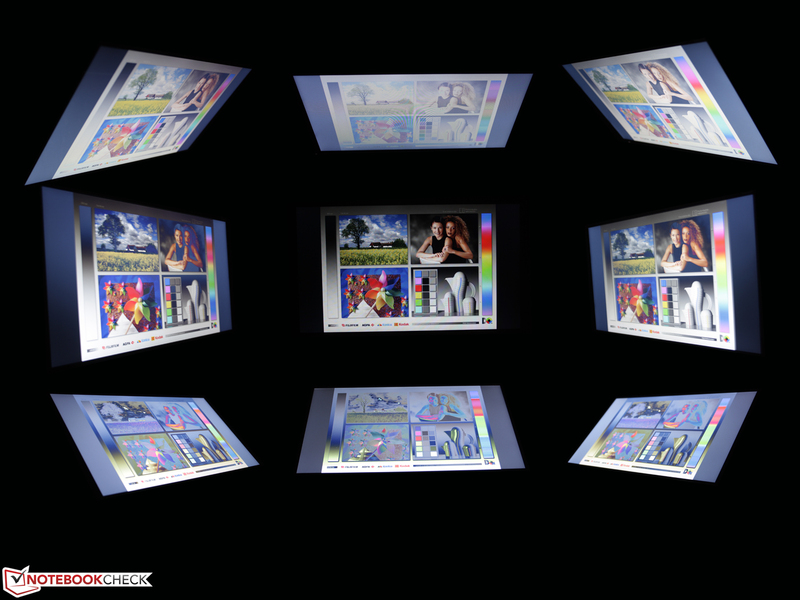 The IdeaPad S206 uses an InfoVision M116NWR1 R4 TFT display with an HD (1366x768) resolution and a 16:9 aspect ratio. This display matches exactly what one might expect from a low-cost device. While hardly convincing, the screen is adequate for the price and there are no alternative options. In our testing, the glossy glare-type display demonstrated an average brightness of 200 cd/m2, adequate for indoor use provided the device is not placed near a window. As well, the measured black value of 1.53 cd/m2 results in an extremely low contrast ratio of only 135:1. In practical terms, this contrast ratio can be seen in the grayish black tones and colors which are neither crisp nor bright. This disadvantage is somewhat mitigated by the glare-type display. However, the glare-type display cannot overcome the display’s shortcomings in terms of color space. In our tests, the IdeaPad S206’s display only covered half of the AdobeRGB space and only slightly better in the sRGB space. As this is a limitation that primarily affects professional image processing, this drawback should not be significant in such a low-cost system. 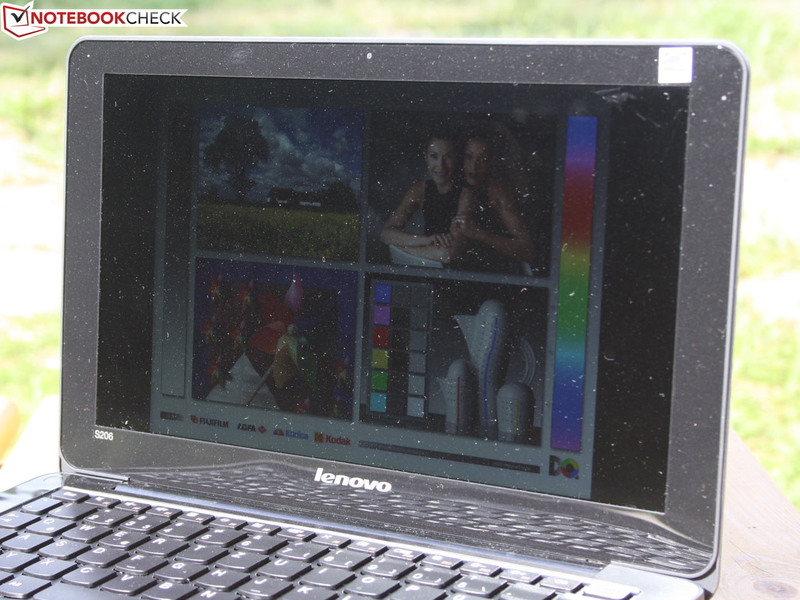 In outdoor use, users of the Lenovo IdeaPad S206 are unlikely to be pleased with the results. The lack of a matte, anti-reflective display combined with the low average brightness resulted in an essentially unusable display. For outdoor use, the display should have had a brightness of at least 250 cd/m2. 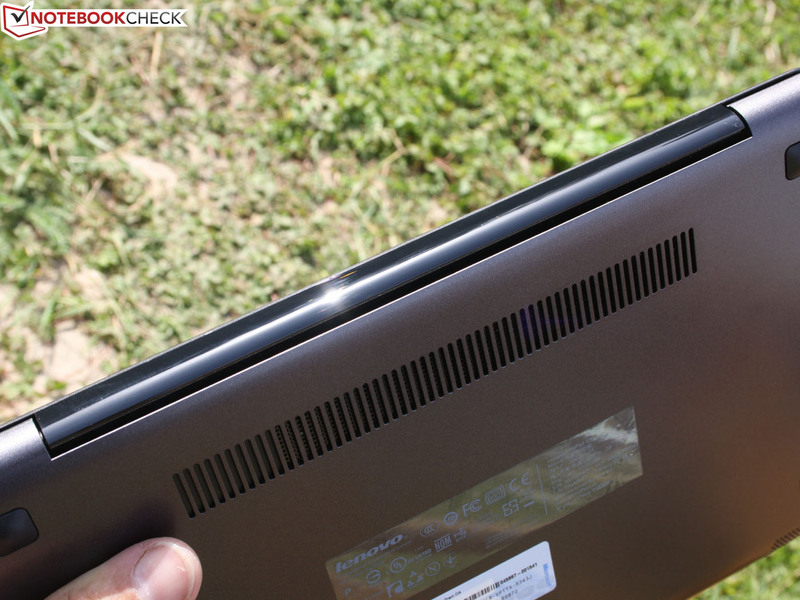 The IdeaPad S206 offers underwhelming horizontal viewing angles which we considered to be less than good. 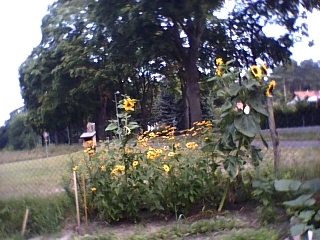 A deviation of up to 45 degrees from head-on viewing resulted in a mostly unchanged display. Beyond this, color inversion began to show. In the vertical axis, things were considerably worse. Displayed text remained legible to approximately 30 degrees of deviation but color inversion occurred at a very modest 10 degree deviation. These characteristics will be most evident when several pairs of eyes attempt to view content on the IdeaPad S206. More expensive devices such as the Asus UX31A use IPS panels which support undistorted viewing angles of up to 90 degrees in the horizontal axis. The 11.6-inch Lenovo IdeaPad S206 is equipped with an AMD Accelerated Processing Unit (APU) which integrates a graphics card into the processor. The two “Bobcat” cores of the AMD E1-1200 operate at 1.4 GHz and are considerably less powerful than Intel’s ULV (ultra-low voltage) Core i processors but more powerful than the competing Intel Atom series. As a direct competitor to the weaker Atom series, AMD’s APUs have been successful for the past one-and-a-half years. For a slight surcharge, the customer can choose a “power version” of the IdeaPad S206 which comes with the 1.7 GHz AMD E2-1800. As shown by the Cinebench R10 bar charts in the Processor section, there is a significant performance gain of approximately 26 percent. While there is no turbo boost, the CPU cores can reduce their clock speed to 800 MHz while idle to conserve energy. The netbook also features 4 GB DDR3 RAM in one SODIMM module. Window 7 Home Premium 64-bit is pre-installed on the 500 GB Seagate hard disk. The APU-integrated ATI Radeon HD 7310 is designed to handle multimedia tasks and provide relief for the CPU in graphical tasks. As the 3D performance of the Radeon HD 7310 is lower than that of the ATI Radeon HD 7340 of the AMD E2-1800, modern games are out of the question. In our testing, we compared the performance of the Lenovo IdeaPad S206’s AMD E1-1200 “Zacate” APU with the optional 1.7 GHz AMD E2-1800 and preceding models AMD E-450 and AMD C-60. Alternatively, we also compared our system’s processor to the Intel Pentium 987, not to be confused with the Intel Atom N2600, from the Acer Aspire One 756. We began our standard testing by comparing these processors in Cinebench R11.5 (64 Bit) where our AMD E1-1200 scored 0.52 points in the multi-core test. The AMD E2-1800 scored 25 percent more at 0.66 points. Depending on the test system, the preceding AMD E-450 scored 10 to 20 percent more. The only processor slower than that of our test system was the AMD C-60 which scored 0.45 points, representing a performance that is 15 to 20 percent slower. The Intel Pentium 987 from the Acer Aspire One 756 was clearly ahead with a performance increase of approximately 120 percent. The results of the Cinebench R11.5 single-core test were essentially the same. In this test, the E2-1800 scored 26 percent better than our E1-1200 with scores of 0.34 and 0.27 points respectively. The previous E-450 scored 22 percent better with 0.33 points and the C-60 scored 22 percent worse. Once again, the Pentium 987 maintained its advantage of approximately 120 percent. In order to compare our test system’s E1-1200 with the Intel Atom N2600, we used Cinebench R10 (32 Bit) as netbooks typically ship with Windows 7 Starter which is only available in a 32-bit version. In this test, the Intel Atom N2600 was 7 percent slower and the faster-clocked Intel Atom N2800 found in the Asus Eee PC R052C was even 9 percent faster. The older dual-core Intel Atom N570 was 2 percent slower. Those seeking a netbook with more performance than the Intel Atom should consider the E2-1800 configuration. In our last test, we observed that CPU performance was maintained on battery power as the Cinebench R11.5 multi-core test finished with the same result as during AC operation. 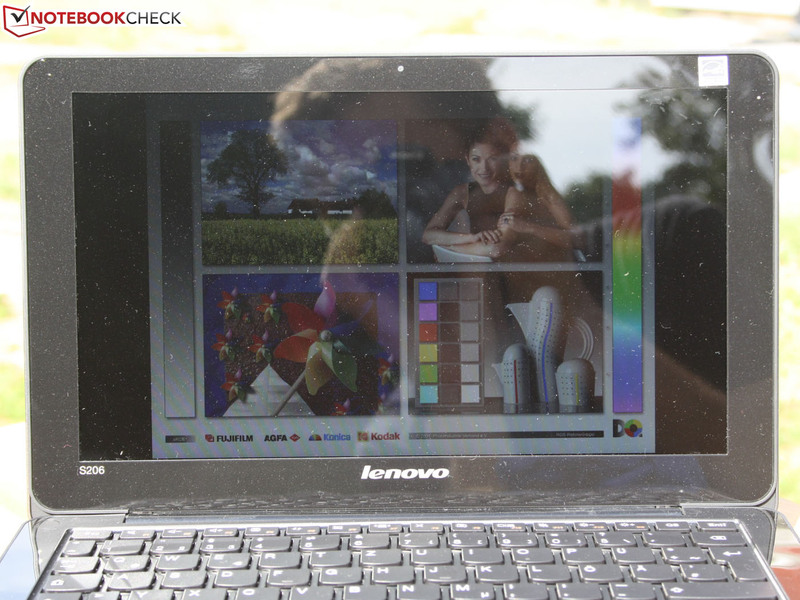 In the previous section, we demonstrated that the CPU performance of the Lenovo IdeaPad S206 is rather low. Does this apply to the graphics card as well? The answer is simply yes, as is the case with other APU-based systems. Our AMD E1-1200 scored only 896 points in PCMark 7. BY comparison, the HP Pavilion dm1-4200sg, which uses the same APU, scored 878 points. 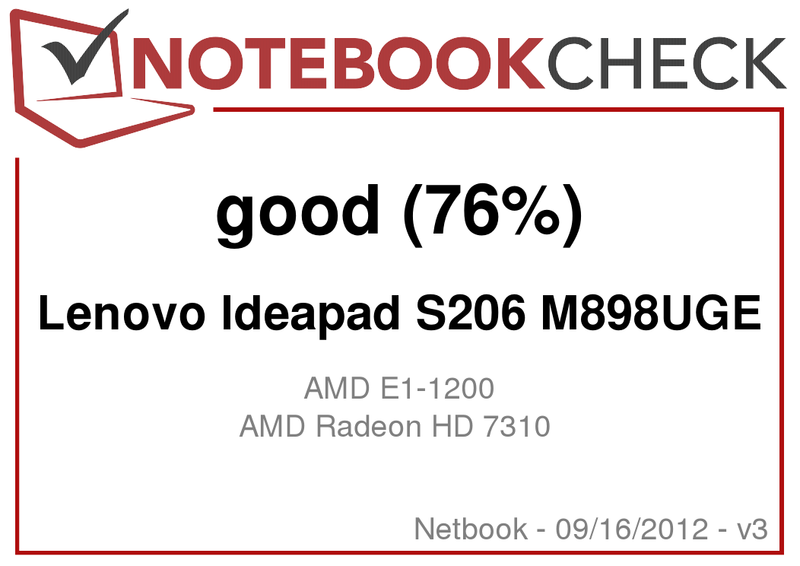 The AMD E2-1800 in the Lenovo G585-M8325GE scored only 10 percent better. The integrated Intel HD Graphics 2000 of the Intel Pentium 987 used in the Acer Aspire One 756 was 62 percent more powerful in the same test. At the low end, Atom-based netbooks such as the Asus Eee PC R052C were 30 to 20 percent weaker for configurations using the Intel Atom N2600 and Intel Atom N2800 respectively. In PCMark Vantage, our test system achieved similar results with a score of 2206 points. The AMD E2-1800 in the HP 655 and the AMD E-450 in the Compaq Presario CQ57-303SG scored at best 12 percent better. 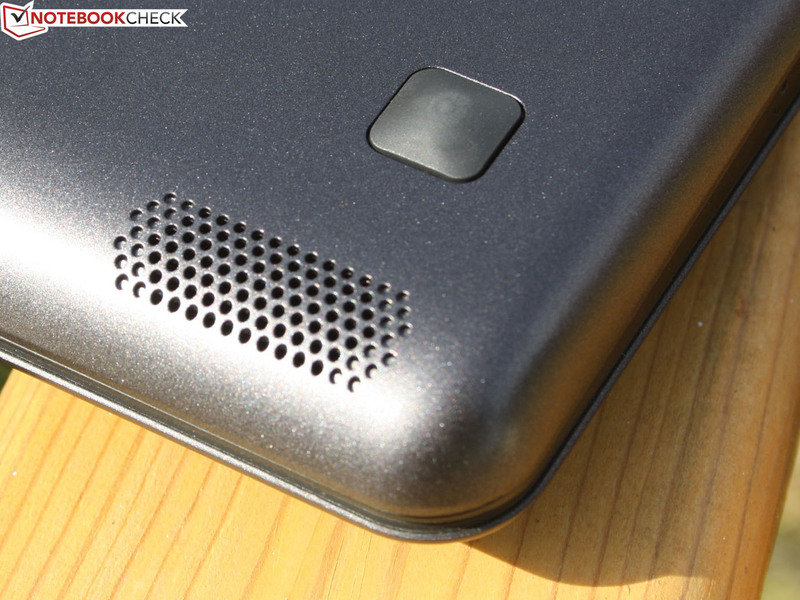 The Pentium 987 in the Aspire One 756 once again set the pace with a 61 percent better score. These results confirm our subjective evaluation of a slow operating speed. Simultaneously running multiple programs, playing HD movies, and copying data over the network caused the system to slow down much more than systems based on Intel Core i and AMD Trinity processors. 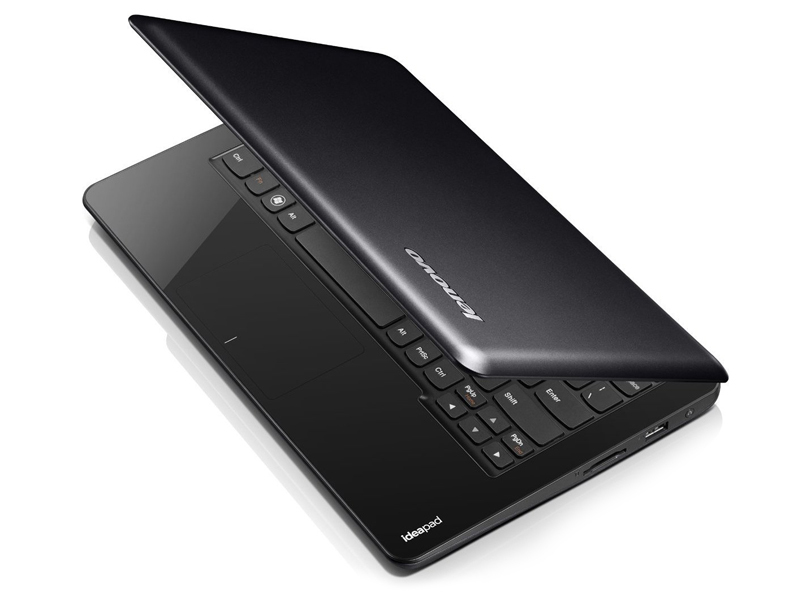 The Lenovo IdeaPad S206’s Seagate Momentus Thin ST500LT0 demonstrated an average read/write speed of 85 MB/s in HD Tune. While this is not particularly high, it is ultimately a good result from a simple 5400 RPM hard disk. We were able to attain a higher throughput of 102 MB/s in Crystal Disk Mark 3.0 which typically records higher transfer rates. This level of performance is typically limited to 7200 RPM hard drives. However, these higher throughputs barely affected the hard drive subsystem scores in PCMark Vantage and PCMark 7. In PCMark Vantage, the IdeaPad S206 scored 3449 points which is far from the 4500 points possible for a fast 5400 RPM hard drive. The storage sub-score in PCMark 7 was 1456 points, a result that is merely mid-level for 5400 RPM hard drives. The reason for these poor performances is that scattered, small files are read very slowly by the Momentus Thin as demonstrated by the 0.66 MB/s result in the Crystal Disk Mark 4K Read test. A large number of common 2.5-inch hard drives from both the 5400 and 7200 RPM categories are up to 150 percent faster in this test. More reference details regarding hard drives and solid state drives can be found in the HDD/SSD benchmark table of our FAQ section. 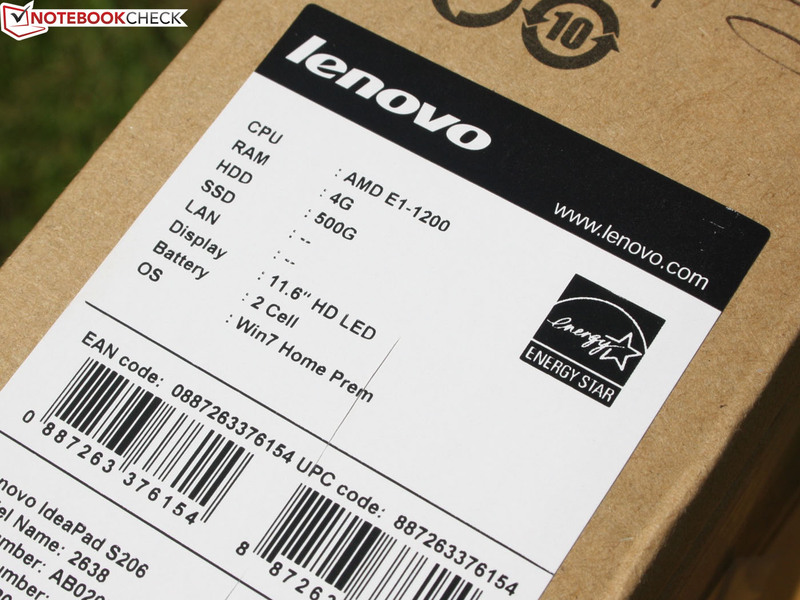 The Lenovo IdeaPad S206 features the APU-integrated ATI Radeon HD 7310. While this card supports DirectX 11, it is hardly a high-performance card. Slightly slower than the ATI Radeon HD 7340 of the AMD E2-1800 APU, the only cards slower than the Radeon HD 7310 are the older Intel HD Graphics 3000 and Intel HD Graphics 2000 integrated graphics cards from the Sandy Bridge family and Intel Pentium 987 respectively. In benchmarks where the CPU is a factor in the graphics score, such as 3DMark06, the Intel graphics cards might even outperform the Radeon HD 7310. The Radeon HD 7310 finished 3DMark06 with a score of 1447 points, a score that is identical to that of the HP Pavilion dm1-4200sg with the same hardware. The Radeon HD 7340 of the AMD E2-1800 was up to 75 percent faster. During gaming, the HD 7340’s advantage shrank to approximately 30 percent as seen in benchmarks of Risen. The older ATI Radeon HD 6320 of the AMD E-450 found in the Samsung 305U1A was up to 65 percent faster in 3DMark06 as well. The 11.6-inch Aspire One 756 and its Pentium 987 were only 58 percent faster than our IdeaPad S206. This performance difference is not due to the HD Graphics 2000 but rather the more powerful CPU itself. As foreshadowed by the synthetic 3D benchmark tests, the IdeaPad S206 is not suited for playing games. We observed excessive stuttering even when playing older games. The measured 42 fps in Fifa 12 was hardly consistent and the game hitched time and again, seriously affecting the gaming experience. There was hardly a game that could be played smoothly. Even the AMD E2-1800 from the HP 655 was not much better. Details regarding this APU and gaming performance can be found in the review of the HP device. The game Risen from 2009 showed that the Intel HD Graphics 2000 in the low-voltage Pentium 987 could not do better despite its higher 3DMark06 score. 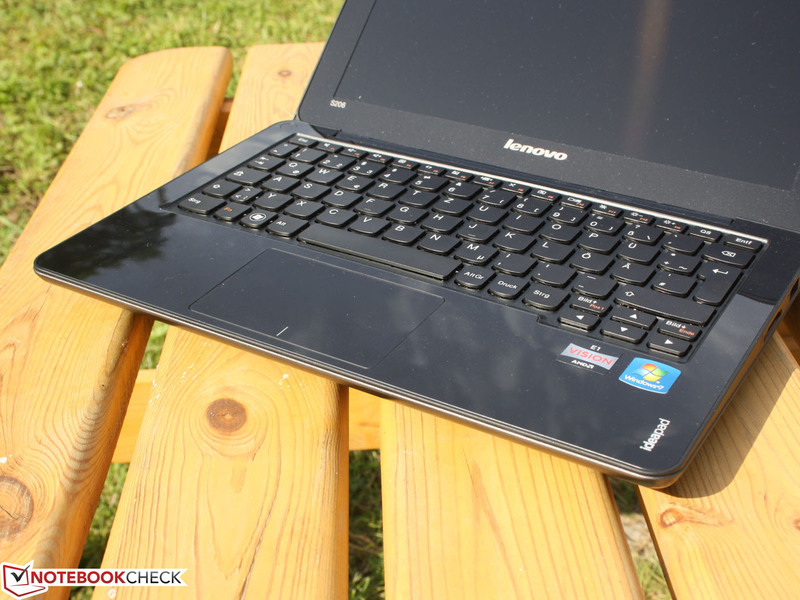 The Lenovo IdeaPad S206 features a fan system which does not fluctuate, a positive trait. Instead of turning on and off, the fan merely adjusts its rotational speed resulting in noise levels between 31.5 dB(A) while idle and under light load and 33.0 dB(A) under the medium load of 3DMark06. We recorded a maximum noise level of 35.8 dB(A) during our simultaneous Furmark (GPU) and Prime95 (CPU) stress test. As this is a rather unrealistic scenario, users should be able to expect a pleasantly low level of noise. The hard drive is only marginally noisier and is therefore barely noticeable as the only perceived noise was a slight, discrete rattling. During basic office tasks and web browsing, the average temperature of the base unit and underside remained just under 32 degrees Celsius (90 degrees Fahrenheit) while mostly idle. The wrist rest was a bit cooler at 31 degrees Celsius (88 degrees Fahrenheit). This changed considerably during the Prime95 / Furmark stress test in which the netbook’s rear edge reached 53 degrees Celsius (127 degrees Fahrenheit). As well, the average temperature reached 45 degrees Celsius (113 degrees Fahrenheit) on both the underside and the top of the base unit. Meanwhile, the CPU and GPU temperatures reached 92 degrees Celsius (198 degrees Fahrenheit). As AMD Zacate APUs do not have a turbo mode, throttling was not an issue. However heat issues may cause the APU’s idle-mode clock speed to drop to 775 MHz. (-) The average temperature for the upper side under maximal load is 44.6 °C / 112 F, compared to the average of 29.8 °C / 86 F for the devices in the class Netbook. (-) The maximum temperature on the upper side is 53.2 °C / 128 F, compared to the average of 33 °C / 91 F, ranging from 21.6 to 53.2 °C for the class Netbook. (-) The palmrests and touchpad can get very hot to the touch with a maximum of 47.3 °C / 117.1 F.
(-) The average temperature of the palmrest area of similar devices was 29.3 °C / 84.7 F (-18 °C / -32.4 F). At first glance, we were unable to find the speakers of the IdeaPad S206 as there were no openings or grilles on the smooth base unit. Instead, the speakers are located on the underside in the area of the wrist rest. We found the sound quality to be mid-ranged and there was no bass at all. As well, the maximum volume level caused the speaker assembly to rattle. The volume was acceptable for an 11.6-inch device with tiny speakers. 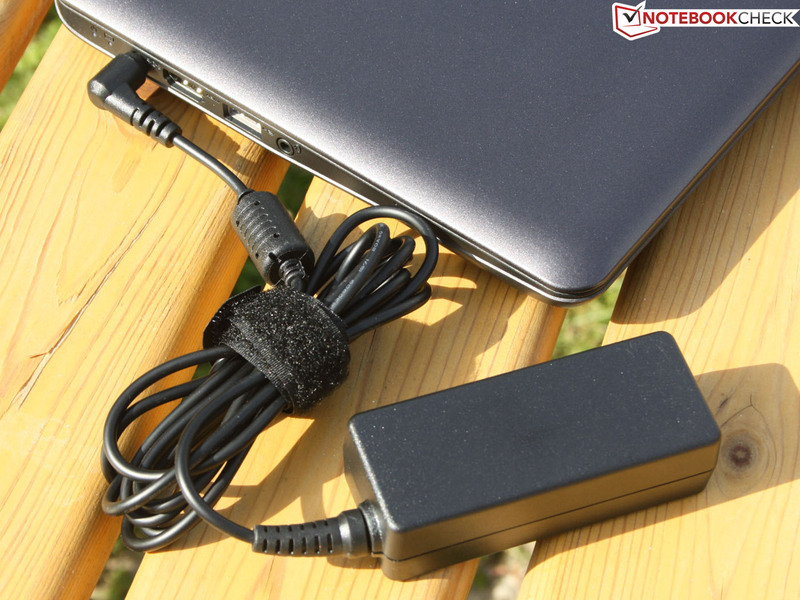 We recommend external speakers for those using this netbook. These can be connected via the combination input/output jack. Alternatively, the audio signal can be output to a receiver or TV using HDMI. 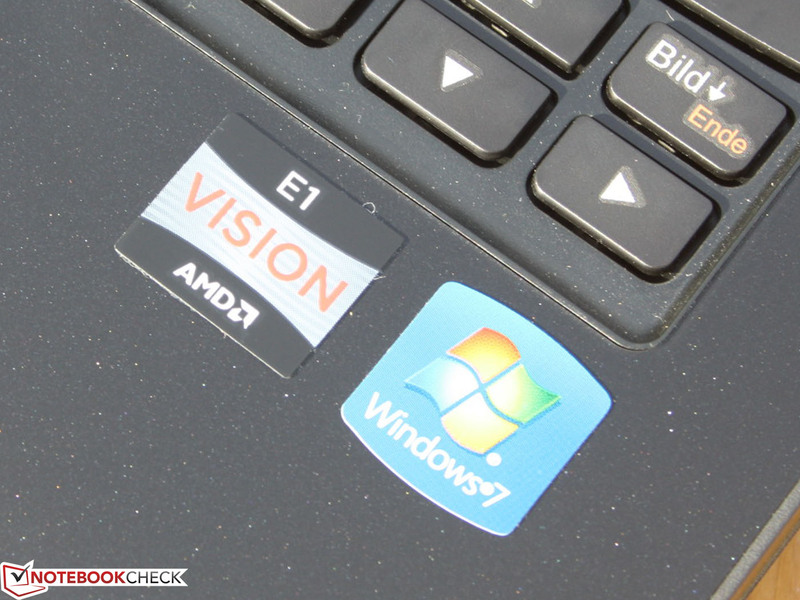 AMD Vision APUs, as in the case of the Lenovo IdeaPad S206 netbook, are not high-performance processors. But are they at least economical and energy efficient? We measured a low minimum power consumption of 8.6 Watts while idle and a power consumption of 23 Watts while under the load of 3DMark06. Depending on power profile, display brightness, and state of the wireless modules, power consumption while idle reached a maximum of 11.2 Watts. When the netbook was subjected to our stress test, power consumption rose to 31 Watts. The netbook’s battery was fully charged prior to this test and during this test, we observed that the included 40-Watt power supply could adequately handle the netbook’s maximum power consumption. By comparison, the HP Pavilion dm1-4200sg, which has both the same 11.6-inch form factor and identical hardware, demonstrated nearly identical values. 11.6-inch netbooks based on Intel Atom processors which might be suitable for comparison are no longer available. The preceding AMD C-60 as found in the Acer Aspire One 722 demonstrated a similar idle power consumption of 8 to 11 Watts but a lower power consumption level of 16 to 18 Watts under load. 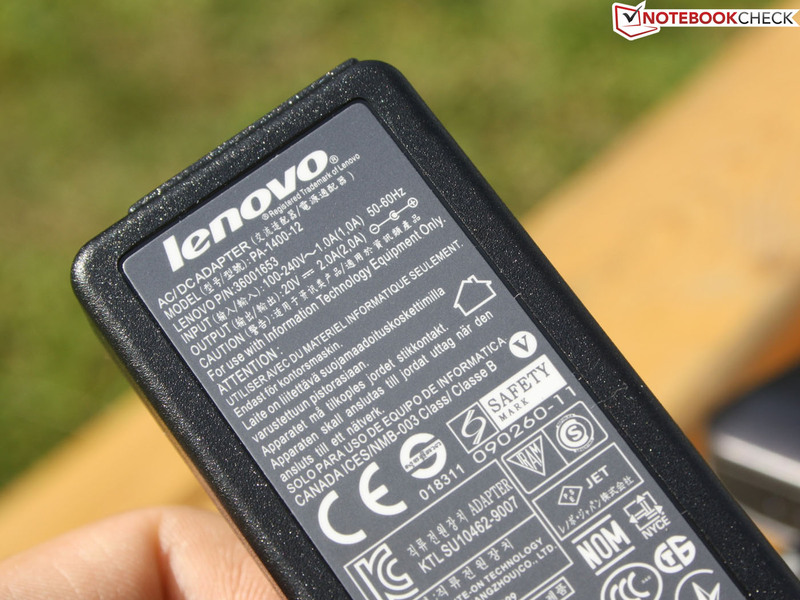 The Lenovo IdeaPad S206 includes a 27-Wh battery. At this capacity, long battery runtimes are out of the question. While idle, this netbook only lasted 4 hours 20 minutes. This result is hardly realistic as this measurement was conducted using minimum brightness, disabled Wi-Fi and Bluetooth, and an idle APU representing the minimum power consumption of 8 Watts. Our Surfing with Wi-Fi test is more realistic and the netbook lasted 2 hours 12 minutes in this scenario. Considering the very short runtime of 1 hour 33 minutes under full load, this low-cost IdeaPad S206 netbook made a very bad impression in this regard. While the APU is in fact economical, the poor battery capacity limits the netbook to a meager performance. The battery also required two hours for a full charge, a rather long time for such a small capacity. By comparison, all other APU-based netbooks performed better. The reason for this is that other manufacturers use larger battery capacities. For example, the Samsung 305U1A, another 11.6-inch netbook with a 66-Wh battery, demonstrated its impressive battery runtime of 8 hours 45 minutes in the Surfing with Wi-Fi test. Considering the power consumption of the Samsung S305U1A, this could have been achieved in the IdeaPad S206 had the netbook used a larger battery. The Lenovo ThinkPad X130e managed an equally impressive runtime of 7 hours 7 minutes in the same test with its 62-Wh battery. The low-cost HP Pavilion dm1-4200sg with similar hardware and a 55-Wh battery managed a runtime of 5 hours 55 minutes. The preceding AMD C-60 in the Acer Aspire One 722 achieved a runtime of 6 hours 47 minutes with its 48-Wh battery. 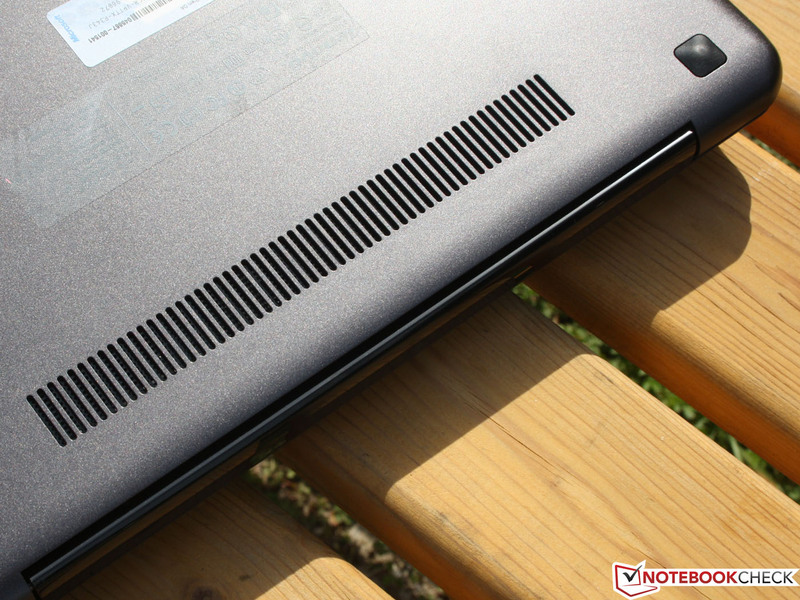 After reviewing the Lenovo IdeaPad S206, we found a number of significant disadvantages such as the sensitive glossy surfaces, noisy keyboard, short battery life, and a merely moderately stable case. After the first few tests of the APU, we did not expect this low-performance second-generation AMD Zacate APU to fulfill the needs of demanding users and gamers. This 11.6-inch device was never intended to be a powerful device, something that cannot be expected from a device that starts at 275 Euro (~$349). As the battery was drained after only two hours, the attractively priced netbook does not offer any other real advantages. 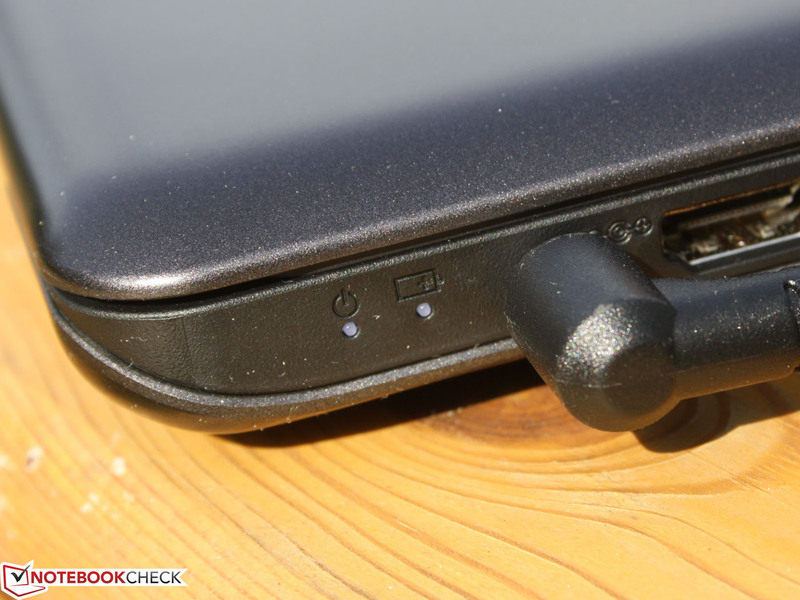 At best, the very quiet operation and the USB 3.0 port are the only features of the Lenovo netbook but the device also lacks VGA and Ethernet connections. Those who do not need mobility, always have a polishing cloth at hand, and only rarely watch videos or surf the Web might appreciate the IdeaPad S206. On the other hand, those who need to run several programs at once on external displays or actually do work on the netbook should choose a netbook that uses an ultra-low voltage Pentium processor such as the Acer Aspire One 756 or the Lenovo ThinkPad Edge E130 in the Free DOS configuration. The respective costs of 349 and 399 Euro (~$449 and ~$499) are low to moderate. For those who feel the AMD E1-1200 APU is fast enough and have no desire to play games, the following devices are recommended as they include mobility features such as a matte display and long battery life: the Samsung 305U1A-A01DE based on the AMD E-450, the Lenovo ThinkPad X121e (configurable with the AMD E-300, E-350, and E-450), and the Lenovo ThinkPad Edge E135 (available with the AMD E-300 and E2-1800). These 11.6-inch devices are 50 to 100 Euro (~$65 to $129) more expensive as well. 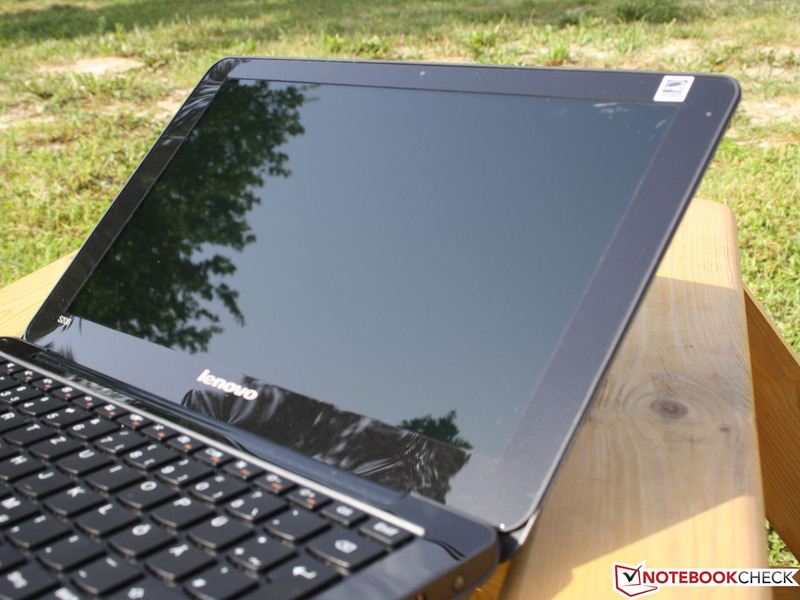 Lenovo IdeaPad S206: Short battery life, mirror TFT, bendable chassis - this 11.6 inch device does not live up to the expectations for netbooks. The merits are hard to find as there are very few. At least there is USB 3.0 and little noise. The small speakers have a passable sound quality. 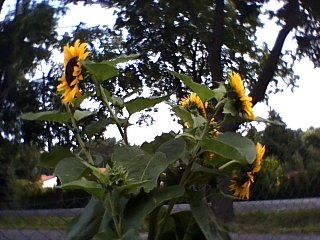 Though the webcam only has a low resolution, it takes photos high in contrast that are relatively well-focused. and is more than sufficient for full load which consumes 30 Watts. A compact and handy-sized plug power supply would have matched this device better. Acer proves this is possible with its Aspire One models (11.6 inch models). The surfaces have to be scrubbed a lot and one would expect better workmanship. and a very short battery life of only 2 hours (Surfing with Wi-Fi test) . new models are now re-entering the market. With prices between 275 and 399 Euro (~$349 and ~$499), the manufacturer does not have huge margins but the quantities can be large. must offer such low-cost devices. 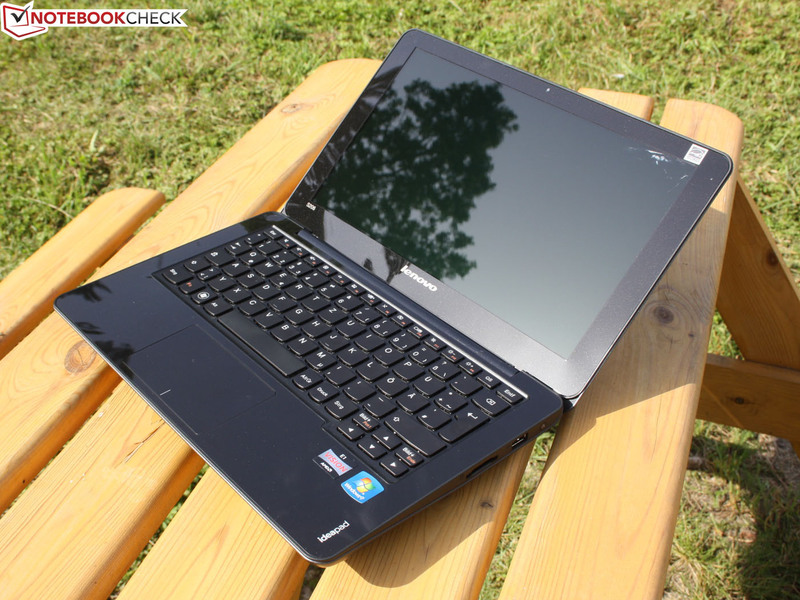 The Free DOS version of this Lenovo IdeaPad S206 is available for a low price of 275 Euro (~$349). This is very cheap for a mobile entertainment and work device. This low price is suspicious. Are there weaknesses yet to be detected? The quality of this netbook is adequate for the price, but is nonetheless bad overall. A short battery life of just two hours and glare-type display offer no mobility at all. There should be more mini notebooks as light and quiet as this one. Mobility. As this netbook cannot be used for more than a few hours on battery and does not have a matte, bright TFT for outdoor use, one might as well buy a 15.6-inch device with higher performance. Why is there such an obsession with high-gloss surfaces? We thought this trend had ended in 2009. Has it returned?